This FAQ explains what to do if the top of your radiator is cold and you don't know what to do. Thermostatic radiator valves (TRVs) are fitted on radiators. They sense the air temperature around them and regulate the flow of water through the radiator. They can improve the comfort in your home by allowing you to set different temperatures in different rooms. This could also save you money and energy. TRVs do not control your boiler and cannot turn the heating off when your home is too warm. A room thermostat should be used with TRVs to achieve this. Where the heating is on and a radiator stays cold, it may need bleeding. You have been given a radiator key to release any air in the radiator. Place the key in the end of the radiator as shown, in the above picture, and turn slowly in an anti-clock wise direction. If there is air in the radiator you will hear a hissing sound of air escaping. If any water escapes turn the key clockwise. If the radiator remains cold please contact OneCALL 0345 8 507 507. 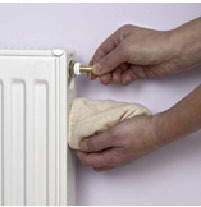 Radiators should not be removed for decorating as this could result in the boiler losing pressure. Our self-help film will show you how to bleed your radiator easily.